Free Spins: For any qualifying first deposit there are 25 bonus spins on Planet of the Apes or Jungle Spirit and for any qualifying third deposit there are 25 bonus spins on Fruit Spin or Hotline. G’Day online casino aims to provide a premium online casino experience and they succeed. The experience begins with three excellent welcome bonuses in succession and moves on to very nice ongoing promotions. Their loyalty program really does reward player loyalty as well. This premium online casino experience routinely includes large prizes and an absolutely huge progressive jackpot. Their selection of games is very impressive and state of the art. For the mobile device player, G’Day online casino offers an excellent app for all users of iOS and Android smartphone and tablet users. They really to provide you with a “Las Vegas-like” experience that fits in your pocket! If you are tired of playing online at the average casino with the average selection of games and average loyalty program, step up to a premium online casino experience at G’Day online casino. You may need to play at G’Day online casino and experience the premium treatment to believe it. It all starts with the welcome bonus. The G’Day welcome bonus is delivered in three phases. Not only do players receive a 100% match on their first deposit up to $/€100, but there are 25 bonus spins on either Planet of the Apes or Jungle Spirit as well. Then, there is a second deposit bonus as well with a 50% match up to $/€250. This bonus is followed by a third welcome bonus with a 50% match up to $/€150! And the third deposit provides 25 bonus spins as well on Fruit Spin or Hotline. Once you settle into playing at G’Day online casino, get ready for “Sensational Sundays.” With this ongoing promotion, players receive a 30% match on their first deposit each Sunday up to $/€100. Simply make the deposit and choose the “Slots and Tables” bonus option and you are ready to go. This great promotion is available each and every Sunday. And, if you like Sundays at G’Day online casino you will really love Mondays. Each and every deposit on every single Monday qualifies for a 25% matching bonus up to $/€100 total. This promotion is available all Mondays. G’Day online casino is a firm believer in rewarding the loyalty of their players. They even award 500 loyalty points for your first deposit! Thereafter, loyalty points are awarded for play. There are five levels of loyalty to strive for from bronze to platinum with progressively better rewards and offers at each level. To check out your loyalty points at any time simply navigate to the Loyalty Redeem page. When you have 1000 loyalty points you may begin to redeem them. Every 200 points is worth $/€1 so when you redeem 1000 points you receive $/€5 as a bonus cash equivalent deposited into your account. When you win a bonus at G’Day casino, the bonus money goes into your bonus account while money you deposit is in your regular account. In order for bonus money to be transferred to your regular account, you need to play for a while. This is the play-through or wagering requirement common to online casinos. In other words, you cannot deposit money, accept the bonus, and then withdraw your deposit along with the bonus money! When you win a bonus with your deposit, both your deposit and any winnings related to playing the bonus are locked in your accounts until you have completed the wagering requirement. The requirement is that you play 35 times the value of the bonus amount at which time remaining money or winnings will be moved to your regular cash account and be available for withdrawal. Not all games contribute equally to the wagering requirement. The majority of slots games contribute 100% to the wagering requirement but not all of them. G’Day online casino has a list of slots that do not on their Terms and Conditions page. Table games and video poker games do not count toward the wagering requirement but Keno and all scratch card games do. Progressive jackpot games also do not contribute to the wagering requirement. As an example, the first welcome bonus provides a 100% match up to $/€100. He or she much play Keno, scratch card games or the correct slots and wager $/€3,500 before the bonus and winnings can be converted to cash and added to their cash account. The G’Day online casino minimum deposit is $/€20. Deposits to G’Day online casino can be made by various methods. These are listed on the “Deposit” tab as players log into their accounts. Players may only use payment methods that are registered to their own name for making deposits. And, G’Day may occasionally limit the number of deposits that a player makes in one day. G’Day does not accept cash and does not allow money to be transferred within their network of accounts. Although security is good for your money when you play at G’Day online casino, they emphasize that they are not a bank! Money should not be put in a gambling account for safekeeping and is in no way insured. If a player repeatedly makes deposits and withdrawals without any wagering, money will be returned minus any bank charges incurred by G’Day online casino. For specifics about use of credit and debit cards or e-wallets, contact their customer service or details. G’Day online casino requires that all players be 18 years of age or older, live at the address they provide and live in a jurisdiction that allows online gambling. The point of all this is that G’Day online casino does not tolerate underage gambling, transfers of illegal funds, or other illegal activity and will take steps to ensure that such things do not happen. Payments by G’Day online casino take place via the same methods that deposits were made. Depending on how much you were required to provide in terms of identification upon registering, you may or may not need to provide more to receive payments of your winnings. Once G’Day is satisfied with the legitimacy of your payments, things move quickly and smoothly. There are limits to payments for exceptional winnings. The absolute limit to any winnings is $/€250,000 and payments in that range may be paid out no more than $/€10,000 per month until the payment is satisfied. The games, of course, are why we come to play at G’Day online casino. For a huge variety of exciting slots to table games, live casino games, and scratch games to totally impressive progressive jackpot games, G’Day online casino offers a truly premium experience. G’Day has fast and exciting slots, traditional slots, game-themed slots, and very basic slots. For players who love their slots, G’Day is the online casino for you! Their slot games are from the top of the line developers and available on home computers and mobile devices as well. G’Day offers many exciting games of Roulette, Blackjack, and variations of poker. With G’Day Blackjack games, players cans sort by popularity or by game developer to find the game of their choice. Likewise with Roulette and other table games, players can seek their favourite by searching both popular options and by game developer. Play “for real” against real live players and with a real live dealer at G’Day online casino. The action is immediate and you can experience it from both a home computer and with your mobile device using your iOS or Android app. All that players need do is go to the G’Day site and sign up. The G’Day mobile app works for Android and iOS users, on Safari, Chrome, Windows Phone, and both Opera and Firefox! Play the same games and experience the same excitement wherever you are so long as there is an internet connection. G’Day uses a high level of computer encryption making both your personal information and your money safe. Furthermore, their gaming is fair and secure. 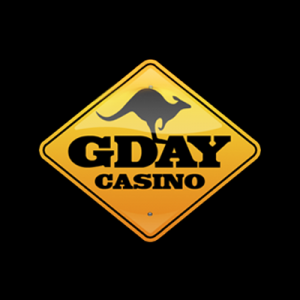 G’Day Casino brand is managed by White Hat Gaming Limited (Company). This company is registered by with Maltese law with registration no. C73232 and their registered office is at 85 St John Street, Valletta, VLT1165, Malta. Also they are licensed and regulated by the Gambling Commission of Great Britain under licence number 000-052894-R-329546-001 for customers in Great Britain and the Swedish Gambling Authority, Spelinspektionen, under licence number 18Li7478 for customers in Sweden (issued for 5 years from 01/01/2019) as well as the Malta Gaming Authority under licence number MGA/B2C/370/2017 (issued 01/08/2018) for all other customers. If you need information or help at G’Day online casino it is easy to find. Simply click “Contact Us” on the upper menu bar. Support is available twenty-four hours a day and seven days a week. G’Day online casino states that they aim to offer a premium online casino experience. We think that they do. The games are great and the welcome bonus, promotions, and loyalty program are all outstanding. We would have preferred that you could phone them or that there would have been a live chat function, but they are available all week long, twenty-four hours a day, and are very responsive to questions. This is a casino worth investigating.